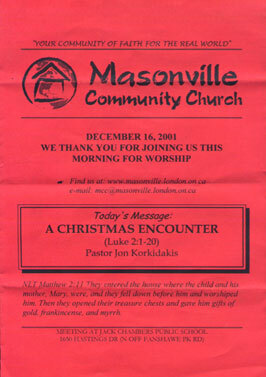 This is a scan of one of Masonville Community Church's church bulletins. Several variations of the logo and text (and without text) were provided to the church, in this example the 2-tone greyscale was used since the bulletin was printed on a laser printer. CSP did NOT design the church bulletin, only the logo and title text were designed by CSP. This sample merely demonstrates the logo in its practical usage.